This month I am really excited to be hosting Forever Nigella for Sarah from Maison Cupcake. I enjoyed taking part last month with the Afternoon Tea theme hosted by Fleur – check out her round up to see all the yummy entries. I had several ideas for this month’s theme and, whilst it might not be super Summer weather at the moment, I am remaining optimistic that the long sunny days are just around the corner, so the theme is going to be Sizzling Summer. Whether it delicious BBQ dishes, Summery salads or desserts to cool you down, I’m sure that even if the sun doesn’t shine, we can come up with a whole host of Sizzling Summer recipes from our favourite domestic goddess. To enter this month’s Forever Nigella, prepare and blog one of Nigella’s recipes, relevant to the theme of ‘Sizzling Summer‘, then submit it to the linky below. I will post a round up of all the entries on 1st August. n.b. posts must have been published since the announcement post. Archived posts need to be re-published afresh if you wish to submit. You must NOT reproduce Nigella’s recipes verbatim. Tell us which book it is from and/or link to it online. If you’ve adapted the recipe in some way i.e. changed at least two ingredients or amended the method then it’s ok to publish the a recipe in your post but you MUST write directions in your own words. Email me the link to your post (cakeshopcorner@gmail.com), copying in Sarah (sarah@maisoncupcake.com). Also please do enter the linky below. You can also tweet your post using the hashtag #forevernigella. Find me @amylane and I will retweet any that I see. You will find Sarah at @MaisonCupcake. This month 3 winners will be chosen at random and each will win a Tala Cake Stand and 12 hole muffin tin like those pictured below. The prize can be mailed EU wide. I can’t wait to see all your Sizzling Summer cooking! 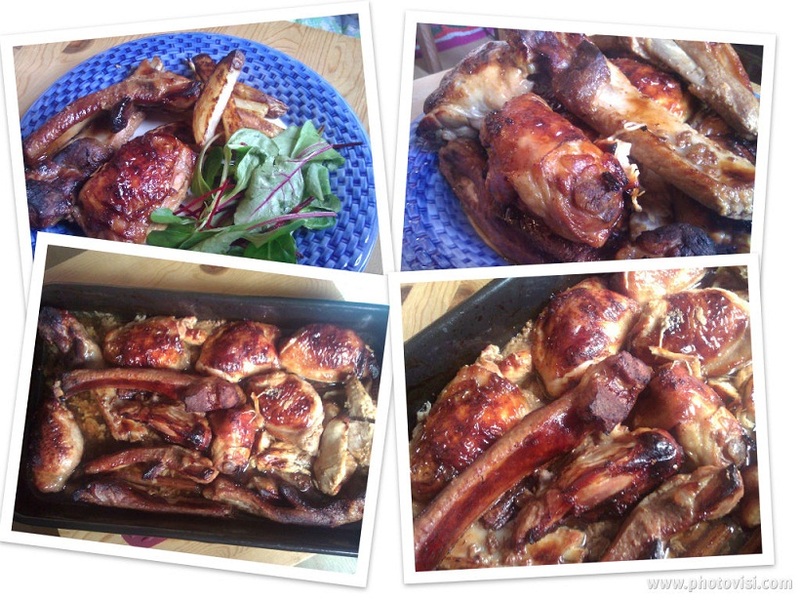 It would have been great to cook these fabulous maple chicken ‘n’ ribs on the BBQ but the weather had other ideas! But still, I followed the recipe from Nigella’s website, only substituting the star anise for a couple of teaspoons of ground mixed spice and cooked them in the oven. The chicken and ribs need to marinate overnight in the fridge so make sure you start preparing them the day before! They were delicious and went down a storm in our house. We all agreed that they would be even better with a little more maple syrup added to them. And the best thing – there’s still some left for my lunch tomorrow! It’s sod’s law that if you buy a new barbecue it will do nothing but rain for weeks!! We’ve managed to use our new one once so far but fingers crossed for a better July! oh hooray! First time I’ve managed to come across this at the right time [ahem, coughs embarrassedly – helps that I’m following maison Cupcake now ] so, i’m excited because I’m cooking a nigella dessert for a BBQ tomorrow, so i will join in! Fab! Can’t wait to see your entry. Oh for a sizzling summer! Having said that, I’ve just made some ice-cream. Unfortunately it wasn’t a Nigella recipe so I’ll have to have a think and see if I can squeeze something in before 28th.